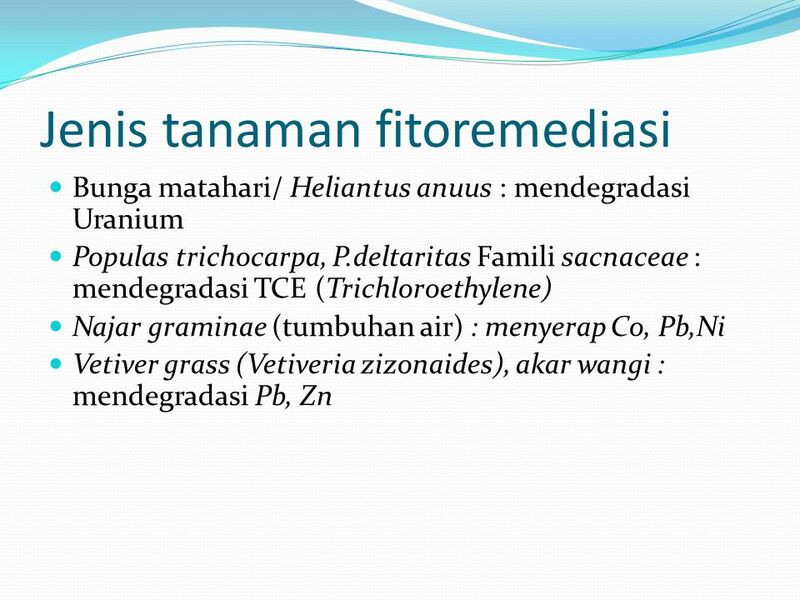 Phytoremediation Dr. Tini Surtiningsih, Ir., DEA. 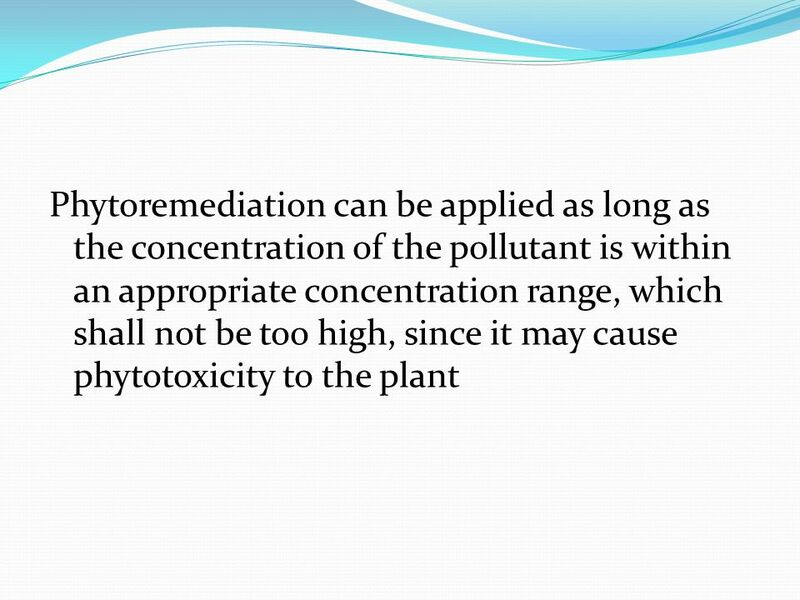 5 Phytoremediation can be performed following different methods: Phytoextraction: Uptake and concentration of pollutants from the environment into the plant biomass. 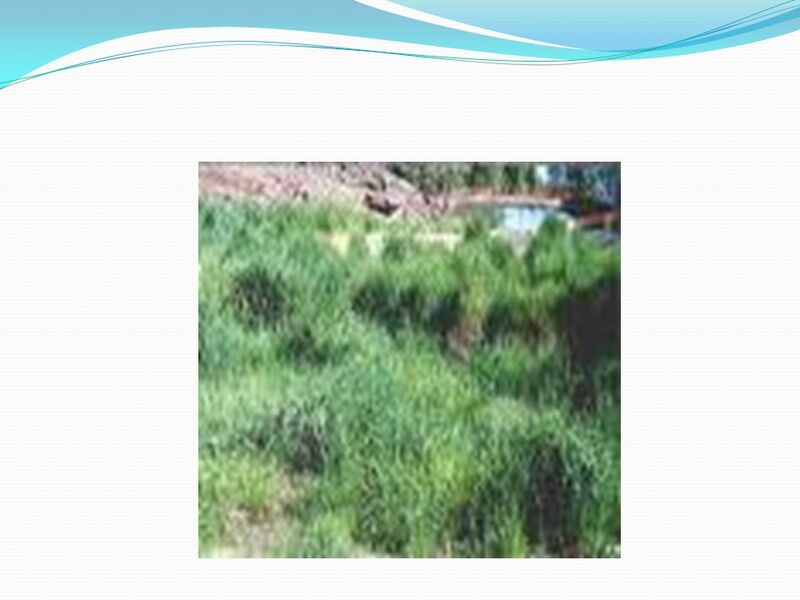 Phytostabilization: Reduction of the mobility of the contaminants in the environment. 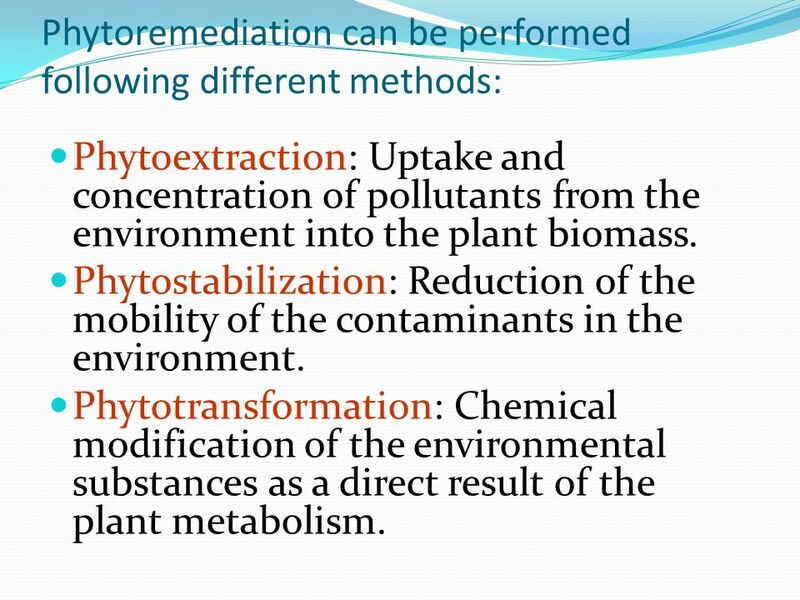 Phytotransformation: Chemical modification of the environmental substances as a direct result of the plant metabolism. 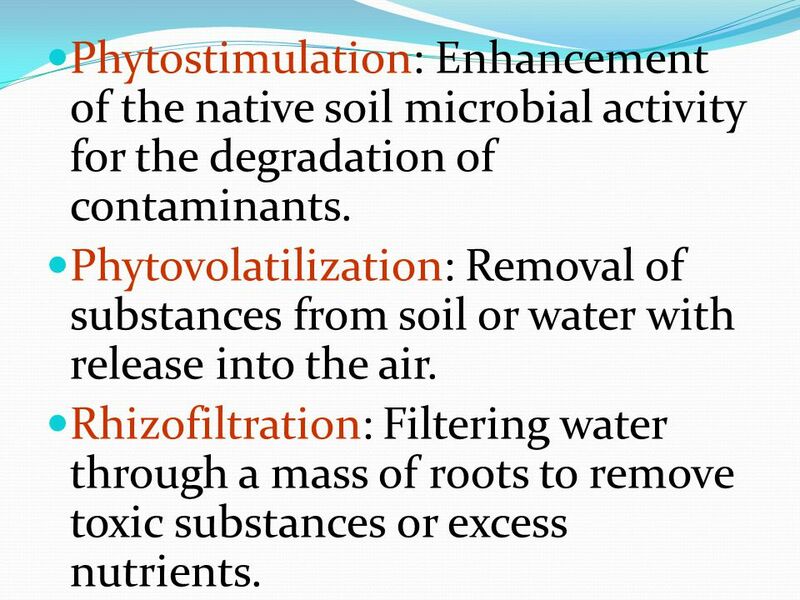 6 Phytostimulation: Enhancement of the native soil microbial activity for the degradation of contaminants. 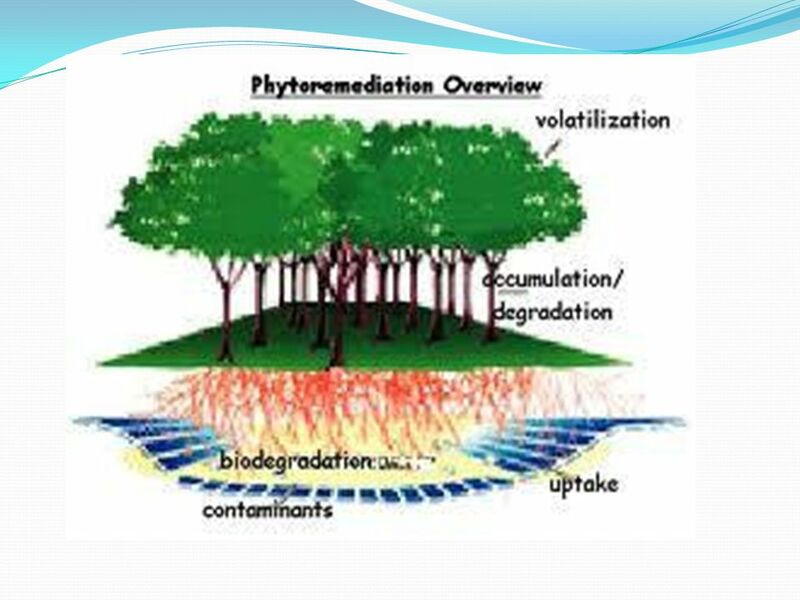 Phytovolatilization: Removal of substances from soil or water with release into the air. 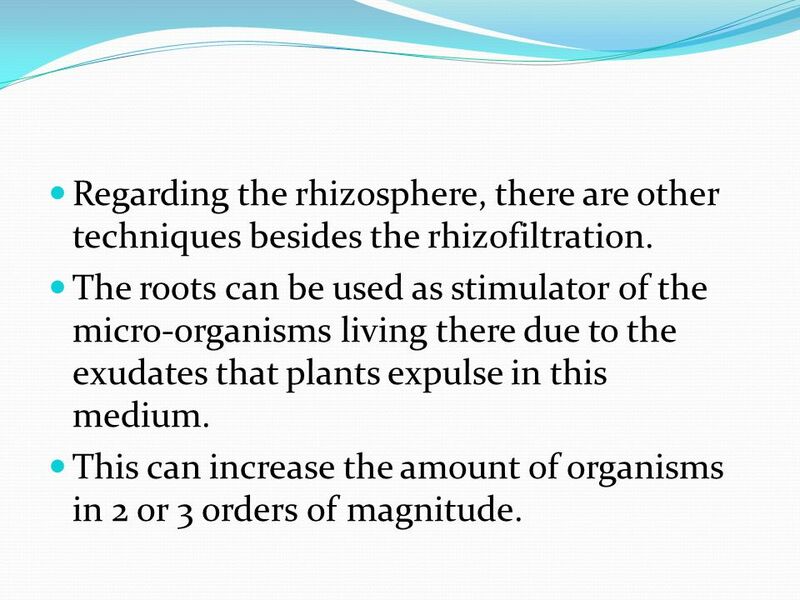 Rhizofiltration: Filtering water through a mass of roots to remove toxic substances or excess nutrients. 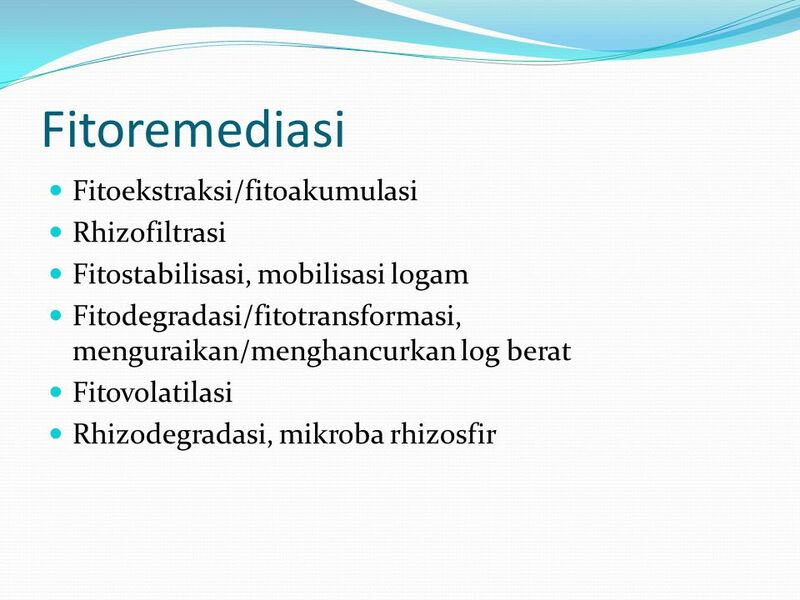 7 Regarding the rhizosphere, there are other techniques besides the rhizofiltration. The roots can be used as stimulator of the micro-organisms living there due to the exudates that plants expulse in this medium. This can increase the amount of organisms in 2 or 3 orders of magnitude. 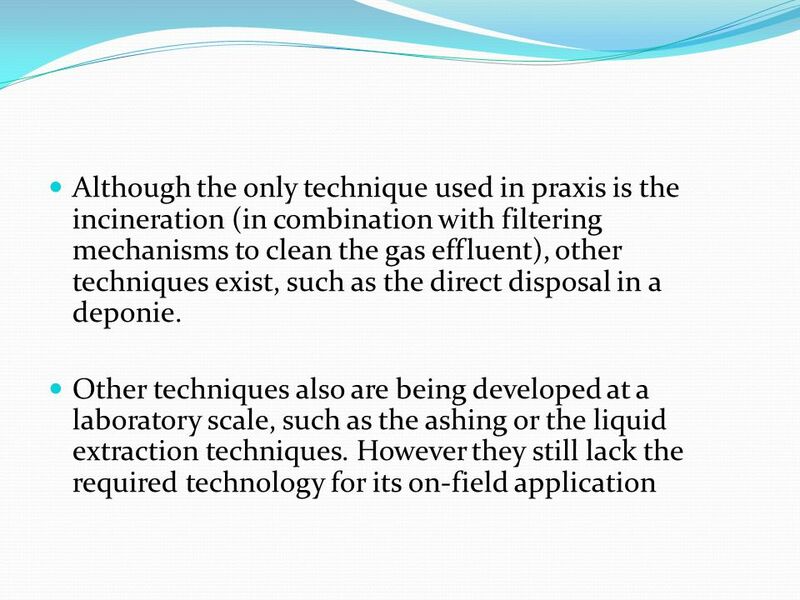 8 Within remediation, one of the most important factors to take into account is the tolerance of the plant. 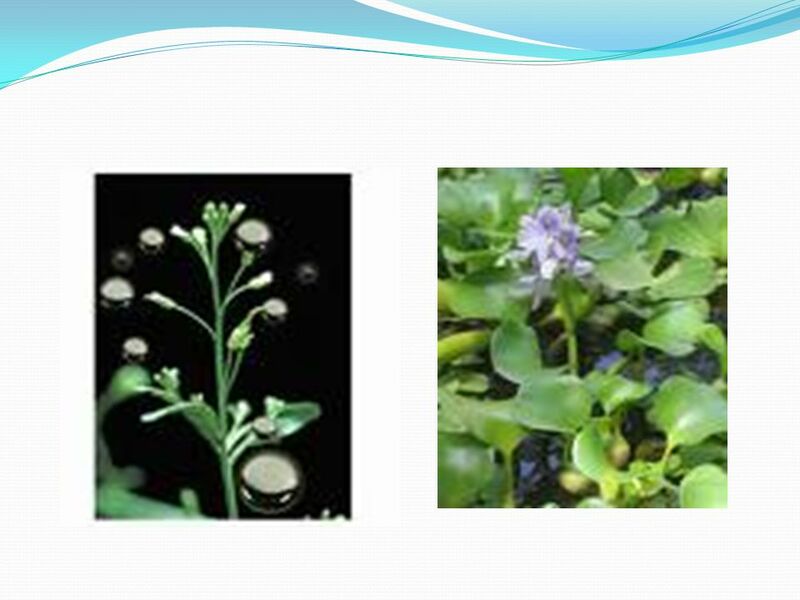 The same chemical species may produce different effects at the same concentration in different plants. 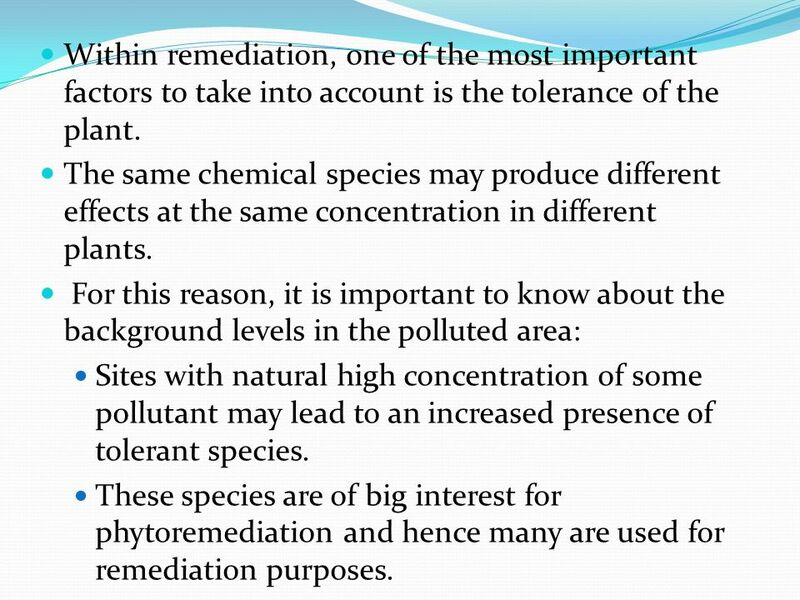 For this reason, it is important to know about the background levels in the polluted area: Sites with natural high concentration of some pollutant may lead to an increased presence of tolerant species. 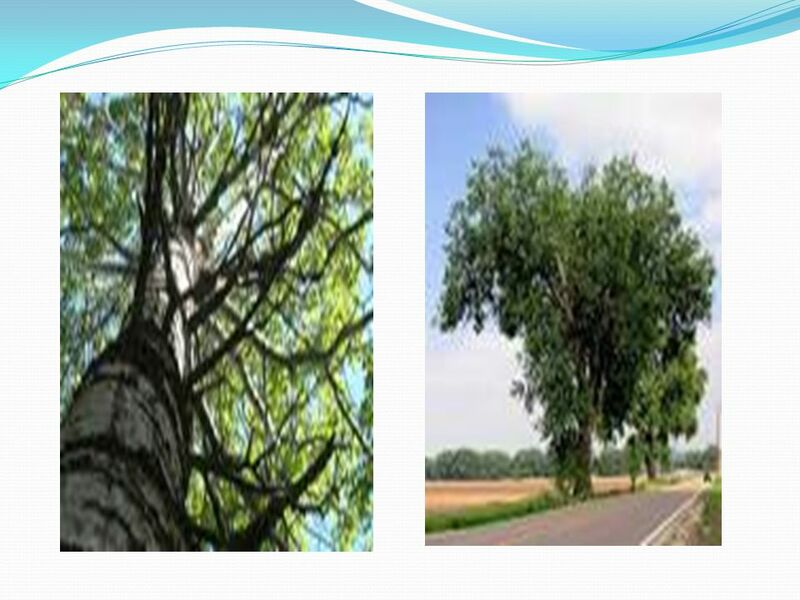 These species are of big interest for phytoremediation and hence many are used for remediation purposes. 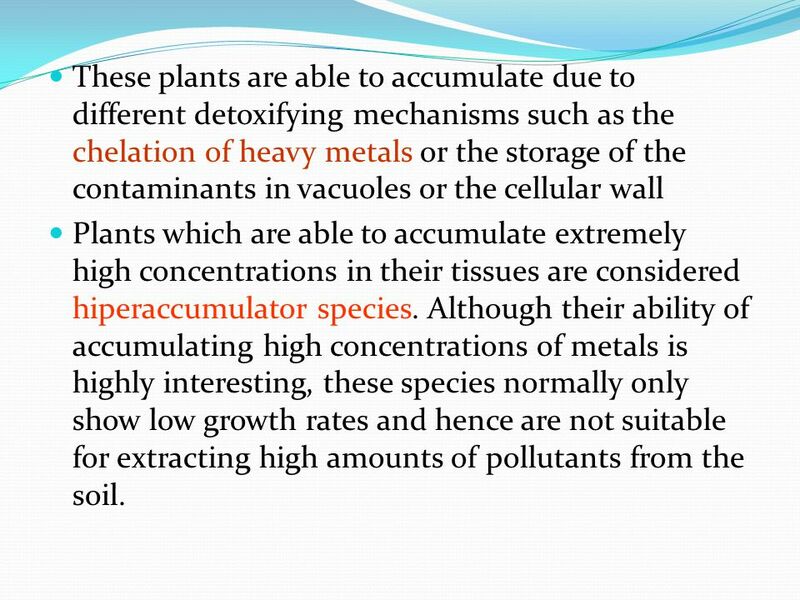 9 These plants are able to accumulate due to different detoxifying mechanisms such as the chelation of heavy metals or the storage of the contaminants in vacuoles or the cellular wall Plants which are able to accumulate extremely high concentrations in their tissues are considered hiperaccumulator species. 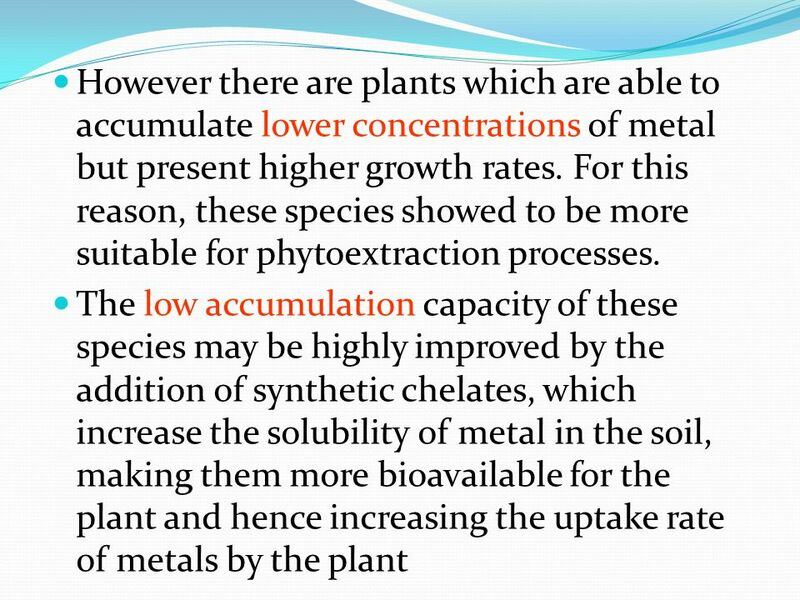 Although their ability of accumulating high concentrations of metals is highly interesting, these species normally only show low growth rates and hence are not suitable for extracting high amounts of pollutants from the soil. 11 . Examples of chelating agents are EDTA, NTA or weak organic acids, such as citric acid. Chelates, however, have to be used with caution, since they may increase the mobility of pollutants, posing a risk of contamination of underlying groundwaters They may also provoke negative effects for the native microbial community of the soil. 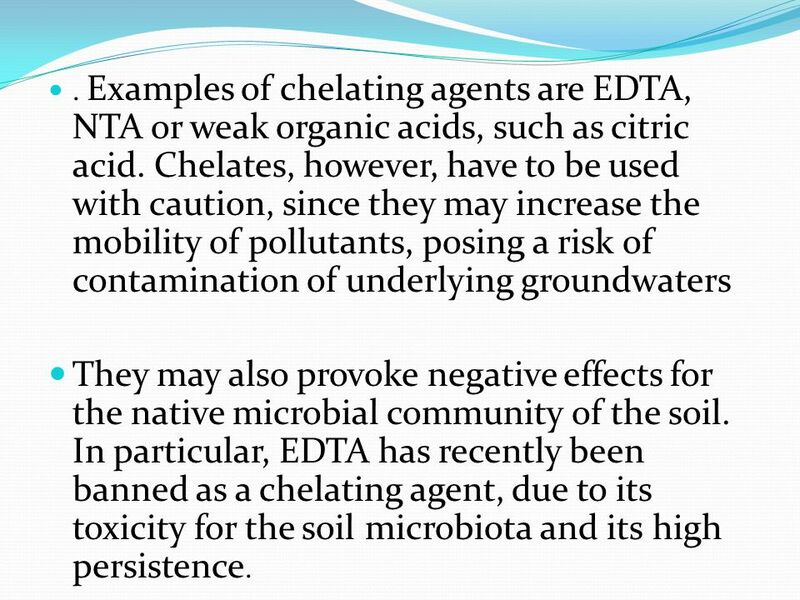 In particular, EDTA has recently been banned as a chelating agent, due to its toxicity for the soil microbiota and its high persistence. 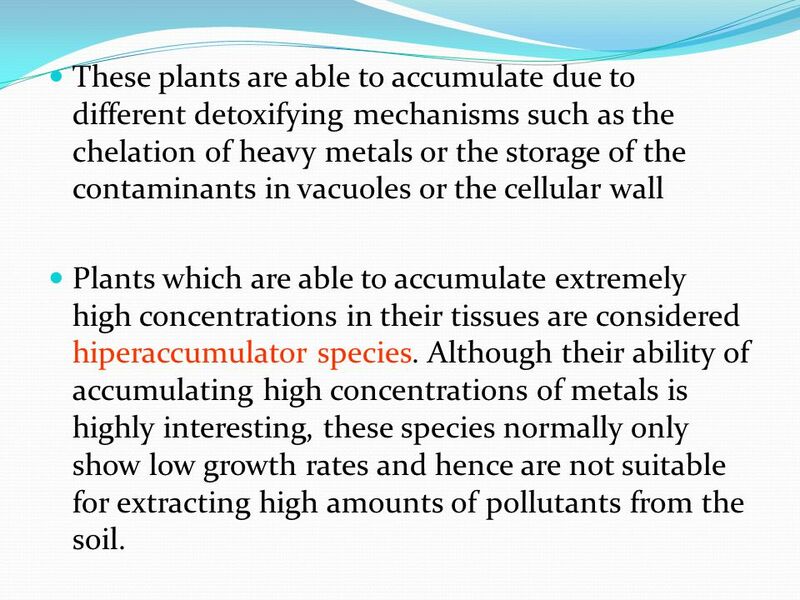 12 These plants are able to accumulate due to different detoxifying mechanisms such as the chelation of heavy metals or the storage of the contaminants in vacuoles or the cellular wall Plants which are able to accumulate extremely high concentrations in their tissues are considered hiperaccumulator species. 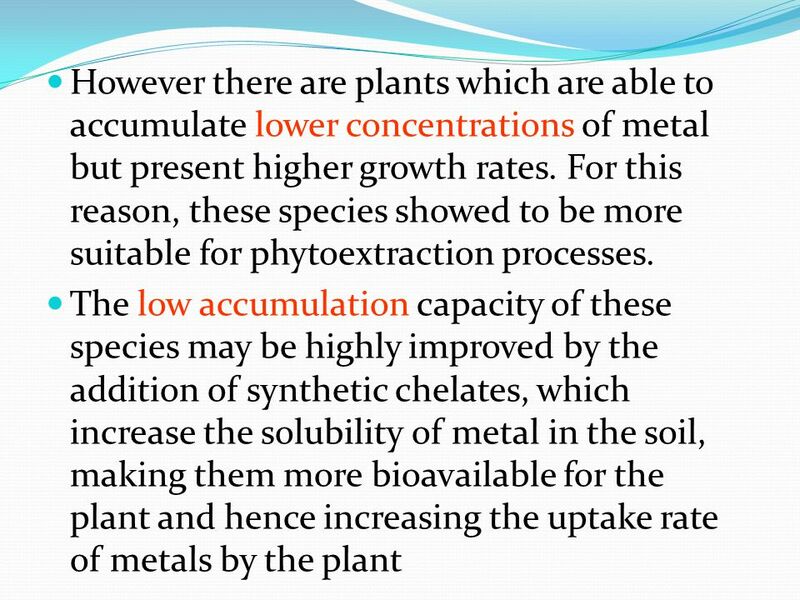 Although their ability of accumulating high concentrations of metals is highly interesting, these species normally only show low growth rates and hence are not suitable for extracting high amounts of pollutants from the soil. 14 Examples of chelating agents are EDTA, NTA or weak organic acids, such as citric acid. Chelates, however, have to be used with caution, since they may increase the mobility of pollutants, posing a risk of contamination of underlying groundwaters They may also provoke negative effects for the native microbial community of the soil. 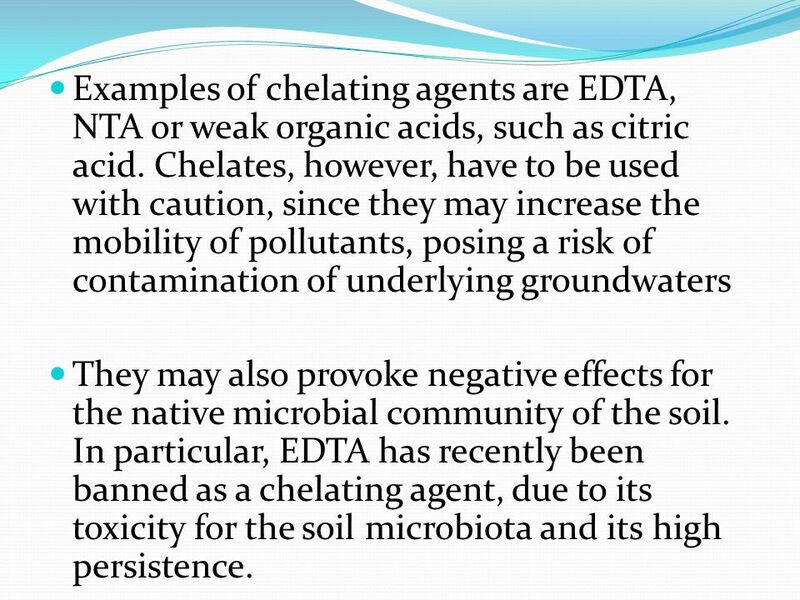 In particular, EDTA has recently been banned as a chelating agent, due to its toxicity for the soil microbiota and its high persistence. 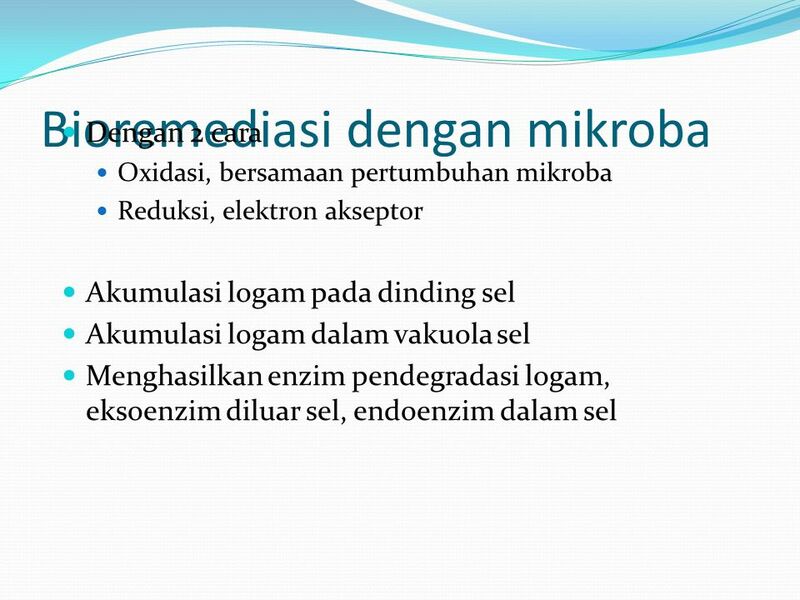 15 To improve the effectiveness of these technologies, genetic manipulation of some organisms can be used. For example, tobacco plant was inoculated with bacterial genes encoding a nitroreductase enzyme. 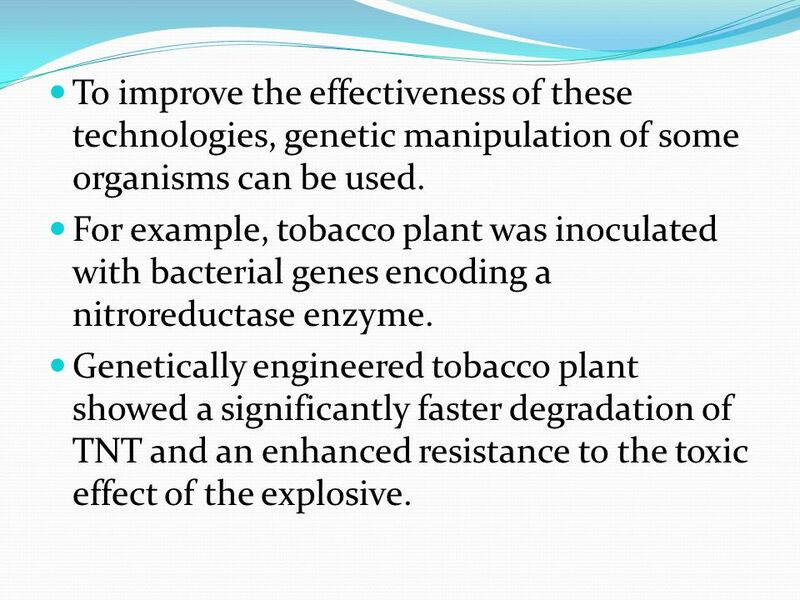 Genetically engineered tobacco plant showed a significantly faster degradation of TNT and an enhanced resistance to the toxic effect of the explosive. 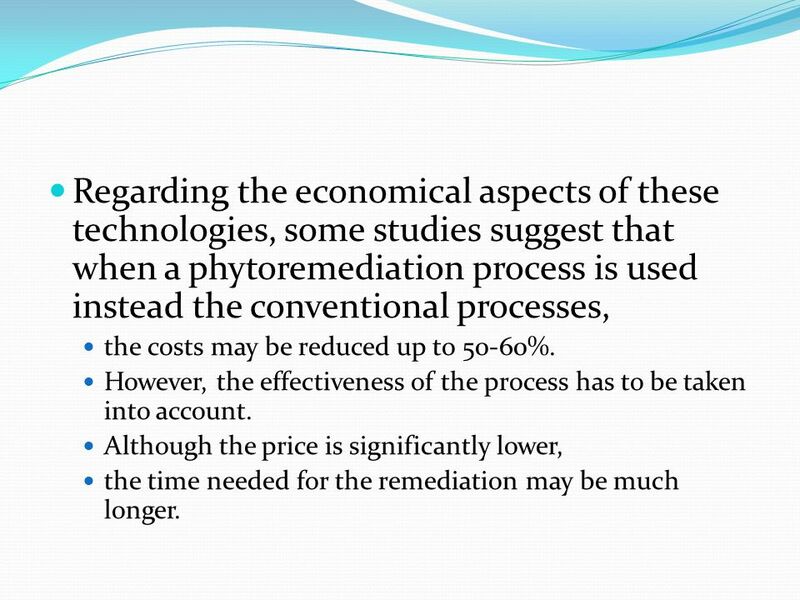 16 Regarding the economical aspects of these technologies, some studies suggest that when a phytoremediation process is used instead the conventional processes, the costs may be reduced up to 50-60%. However, the effectiveness of the process has to be taken into account. Although the price is significantly lower, the time needed for the remediation may be much longer. 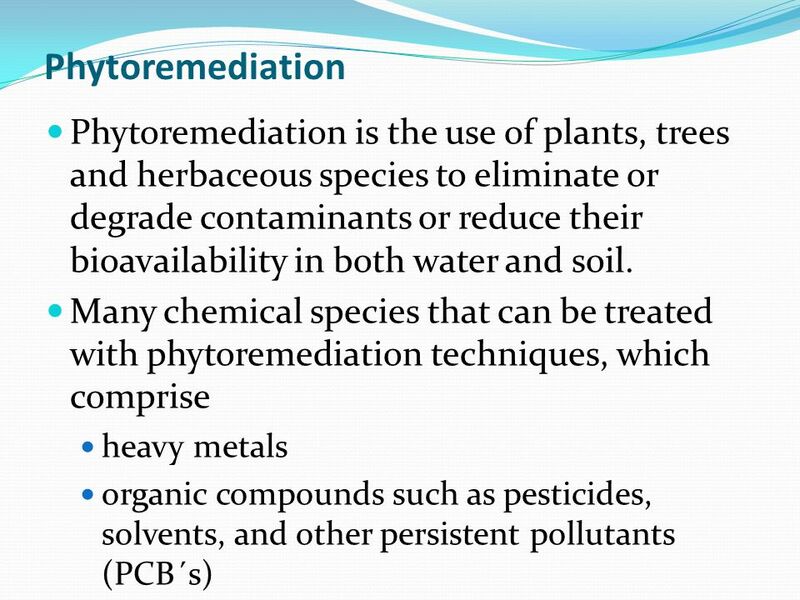 17 No specific regulatory standards have been developed for phytoremediation processes, so that installations must be approved on a case by case basis. 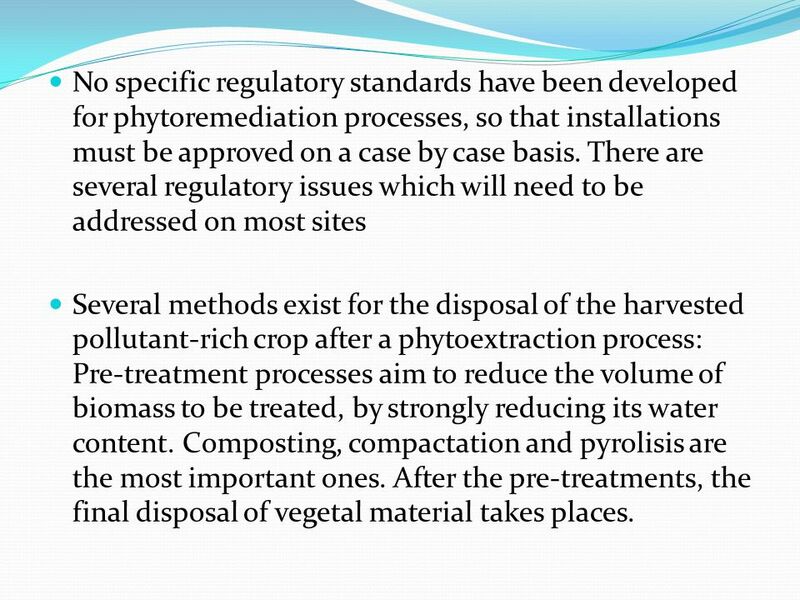 There are several regulatory issues which will need to be addressed on most sites Several methods exist for the disposal of the harvested pollutant-rich crop after a phytoextraction process: Pre-treatment processes aim to reduce the volume of biomass to be treated, by strongly reducing its water content. 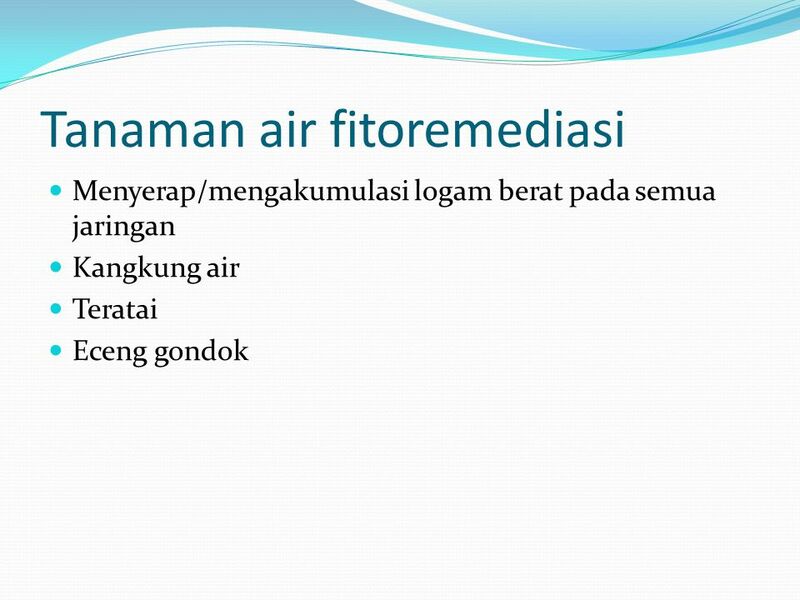 Composting, compactation and pyrolisis are the most important ones. After the pre-treatments, the final disposal of vegetal material takes places. 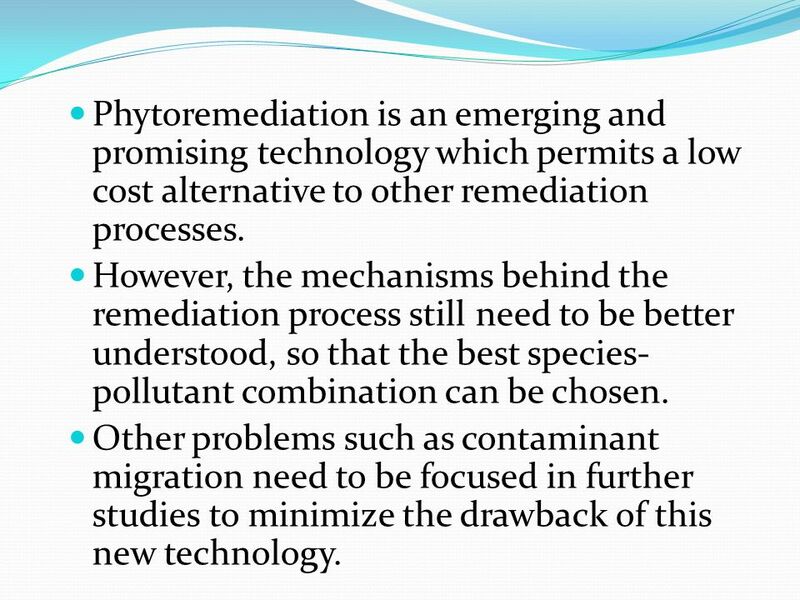 19 Phytoremediation is an emerging and promising technology which permits a low cost alternative to other remediation processes. 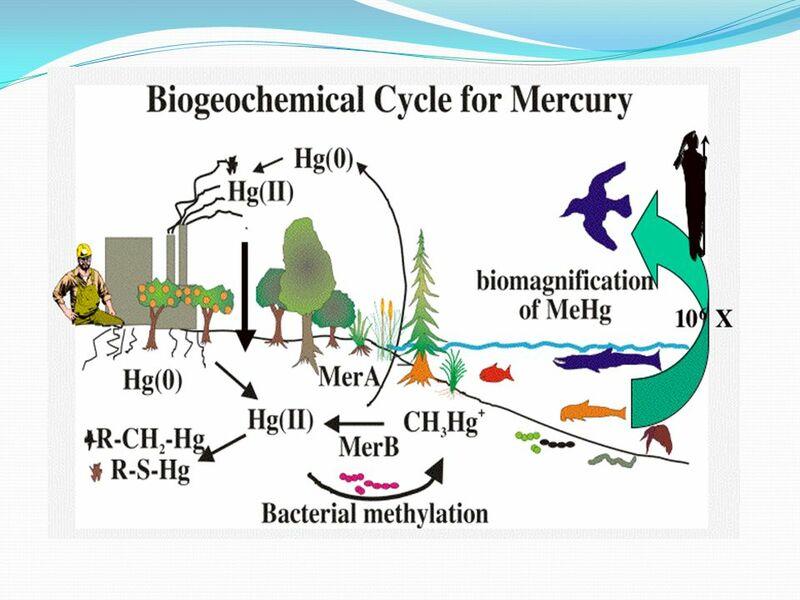 However, the mechanisms behind the remediation process still need to be better understood, so that the best species- pollutant combination can be chosen. 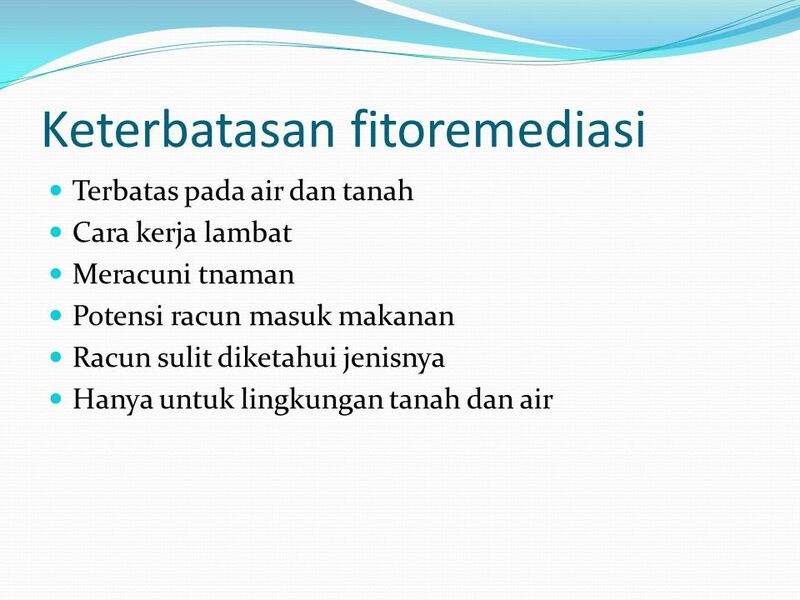 Other problems such as contaminant migration need to be focused in further studies to minimize the drawback of this new technology. 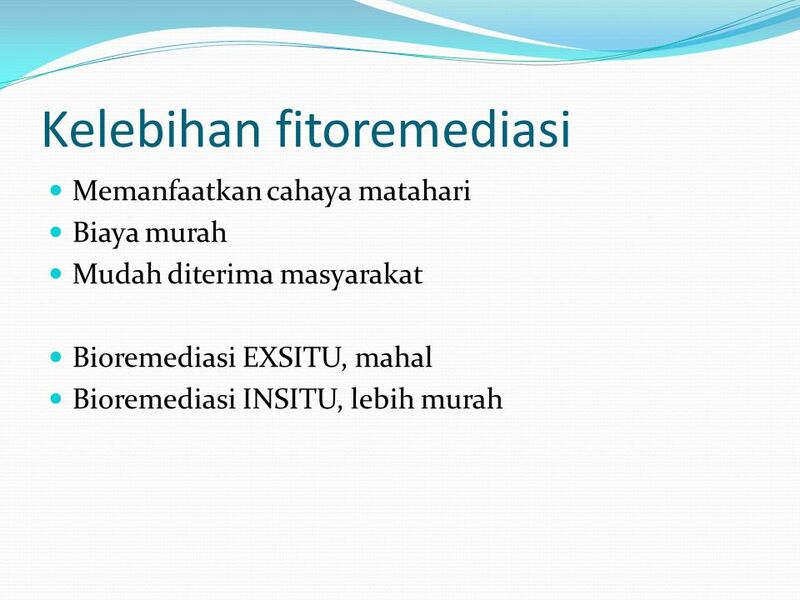 25 TERIMA KASIH ATAS PERHATIANNYA Wassalamu ’ alaikum Wr. Wb. 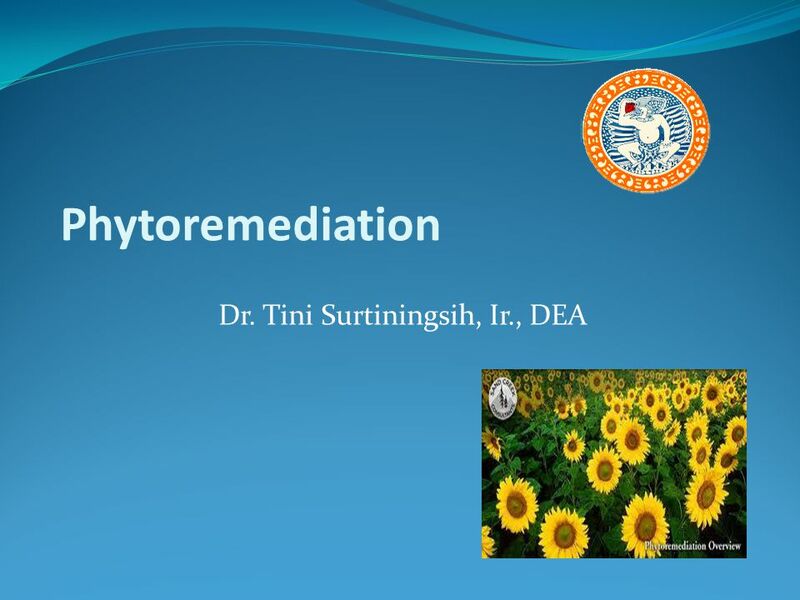 Download ppt "Phytoremediation Dr. Tini Surtiningsih, Ir., DEA." Removal of Cu(II) ions from aqueous solution effluent using Melamine-Formaldehyde-DTPA resin in a fixed-bed up-flow column By Ahmad Baraka Supervisors. Phytotransformation Pathways of the Energetic Material TNT Murali Subramanian 1, Hangsik Moon 2, Sarah Rollo 1, David Oliver 2, Jacqueline V Shanks 1 1. Hazardous waste. Threatens human health or the environment in some way because it is –toxic –chemically active –corrosive –flammable –or some combination. Our consultation services and technologies reflect a wide range of technical expertise. Environmental Geotechnology Presentation Naval Air Station, Pensacola, Florida. Public perception of pesticides Public has a poor understanding of pesticides Public has a fear due to media and from misuse and accidents. Biodegradation of organic pollutants in a composting environment in Mauritius Vijayalaxmi Jumnoodoo PhD Candidate Department of Chemical and Environmental. 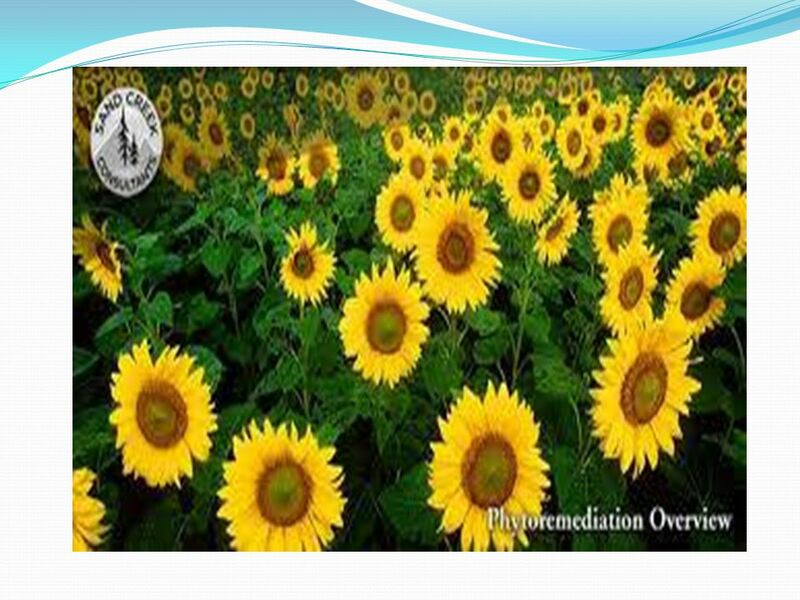 Phytoremediation of Antibiotics Ninad Gujarathi Department of Chemical Engineering Colorado State University PhD May 2005 Advisor: Professor James C. Linden. Phytotechnologies for Environmental Restoration and Management Micah Beard, M.S. Shaw Environmental, Inc.
Permeable reactive barrier using nanoscale iron particles in As contaminated subsurface Emplacement of nano-particle - Emplacement into reactive barrier. 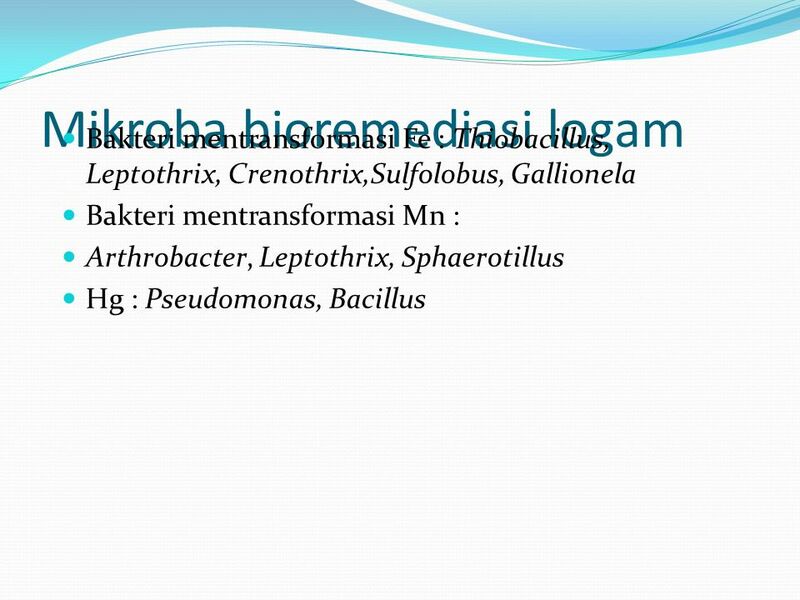 BIOREMEDIATION By: Christina Dimitrijevic, Rachel Brown & Ola Johnston. Enviromental aspects of Brownfield Regeneration Barbara Vojvodíková, Marcela Maturová „This project has been funded with support from the European Commission.